There are many different ways to facilitate wasp control at home. All it takes is your time and effort to drive these little pests away, although you might have to spend some extra dollars for pesticides and pest control assistance. It's important to remember, Wasp encounters can be painful, even life-threatening, for a few highly sensitive people. Yet being a part of the plant pollination cycle, they are also pest predators, meaning they can do you some good to have them around. You can use following quick tips how to keep the local wasp,Bees and Hornetcommunity down near your home and living area. 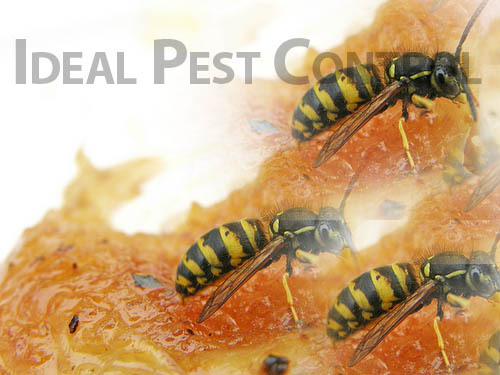 Wasps and hornets may be the biggest problems in homes and yards that provide plenty of food—dropped fruit, exposed garbage, open recycling bins, etc., so sanitation may help avoid problems.Garbage and yard waste are attractants to wasps. They can eat the left over food in the garbage and then make a nest in the compost or yard waste pile. Make sure your garbage bags are in tightly sealed garbage bins and that your yard waste or compost bile are away from the house. Next step will be cleaning up your kitchen too. Do not let your kids just eat fruits and let them fall on the floor and nobody will pick it up and throw it on the bin. Chances are wasps will be coming right to the fruit and eat it. Try to avoid putting anything overly aromatic near your windows or doors of the house, including pines or cedars. Wasps enjoy them as much as we do and sometimes even make nests in them, so try to make sure your house has some decent distance from any really fragrant flowers or fruit producing trees. On the overhang of your roof, up inside the peak of the eves, or sometimes just right below the gutter, you will find wasps making themselves at home on your home. They enjoy places like this because they are warm, dark and often more moist then any where near by You can use some simply caulking to close up an area's like that in the spring. This is an excellent old trick.Simply get a piece of fresh steak and hook it or tie it securely onto a piece of string so that it will not fall off or be easily untied. Then place the stringed strip of meat over the largest bowl of water you can find. You want it to be preferably very wide and at least 4 to 6 inches deep. 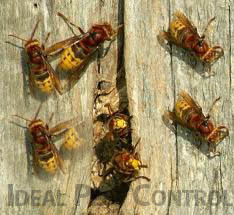 The wasps will eat until their little bodies can't take anymore and then fall off into the water and die. 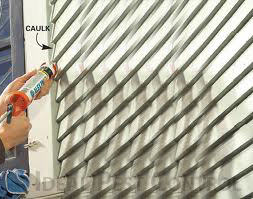 It's a sad death, but it can help if you need to lower the numbers of wasps around your home. There are plenty of home made and store bought traps available to help keep the wasp population in your area down. You can hang them from your roof away from any windows or door and can also hang some in trees away from the garden or kids play area. If ever your wasp nest removal pursuit gets tougher, you can always seek for professional help. 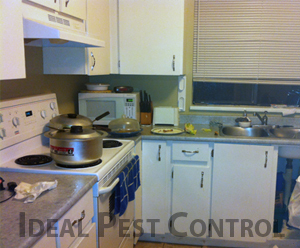 Call IDEAL PEST CONROL LTD at 604-543-1457 to get rid of them.